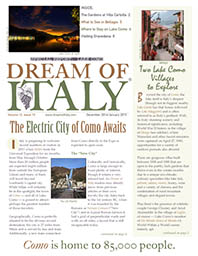 The largest city on Lake Como has plenty to offer from a history of silk making to a new sculpture called “The Life Electric.” We also tell you where to eat and shop in Como – two important pasttimes. Bellagio and Gravedona should be on your must-visit list when you come to Lake Como. Sidebar: The World War II Museum in Dongo. Lake Como is famous for her historic villas and gardens. The creme de la creme of which is Villa Carlotta. Here’s how to plan your visit. From the newest 5-star resort to a lovely, foodie retreat in the hills above the lake, we tell you where to rest your head in the city of Como and beyond.